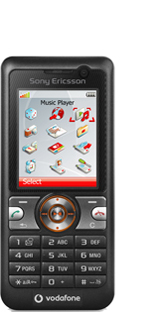 Sony Ericsson V630i is a mobile music and video 3G phone with ability to let you carry hours of your favorite music with you wherever you go and enjoy customized digital radio entertainment with RadioDJ. Sony Ericsson V630i features 262.144 color 176×220 pixel TFD LCD, quad-band support in GSM 900, GSM 1800, GSM 1900 and UMTS, Memory Stick Micro (M2) support, complete music experience with RadioDJ, music player, music Keys, Disc2Phone, USB mass storage, Bluetooth, A2DP Stereo and Stereo Headset, 2 megapixel camera with mobile blogging, HTML Browser with RSS Reader and Smart-Fit Rendering and 3D games. Tech Digest concludes that it does so much stuff, it’s almost overwhelming. It’s got all the business tools, as well as all the entertainment tools. And then it’s got all the phone tools. And by the time you get to the end of it, well, you kind of crave the days when a phone made calls. However, in bitesize chunks, it’s a wonder of modern technology.